Finger Chips are favourite among kids of all age, why just kids it's equally liked by adults too. Most fast foods centres have recorded high sales of French fries than any other food available at counter. But why waste money at fast food restaurants when you can easily prepare them at home with much ease. This would not only satisfy your requirement but also save your money. Today, I am going to post the recipe of french fries which can be easily prepared at home with few notes and tips on how to get it crisper and tastier. Basically french fries are called Indian version of potato chips though they are different. Even french french fries and finger chips are different. French fries are more crisper than our Indian version of Potato chips. French fries are normally freezed potatoes. The potatoes are freezed for 1 or 2 days to make it stiff. In french fries and potato chips its not required. So these 3 are totally different since the way they are prepared differs too. Take the Potatoes and wash them nicely. Peel the outer brown skin and keep aside. Cut the Potatoes in long strips. Get some Ice water and place this strips in them till you complete the cutting of all the potatoes. This will prevent the potatoes from changing it colour and also keep them stiff. Since potatoes tend to change colour when kept open and also the nutrients tend to decrease if kept open for long. When you are completed with the cutting of potatoes, take the potato strips and put them in a zip lock bag and close them properly. Store this zip lock bag in the freezer for few hours. The longer you store , the more crisper the result would be. But don't store for more than 2 days . After storing them for sufficient time, remove them out. Heat oil in a deep frying pan enough to deep fry the potato strips. Once the oil is good hot, put the strips in them one by one. ( Remember the oil should be good hot say bubbling hot, to check it just add a tiny piece in it and you can see bubbles surrounding it). Fry the potatoes well. Once they turn golden brown, remove them and place them over absorbent paper or tissue paper so that the extra oil is absorbed nicely. Now remove them from the paper and sprinkle little red chilli powder and salt when it is still hot and toss well. 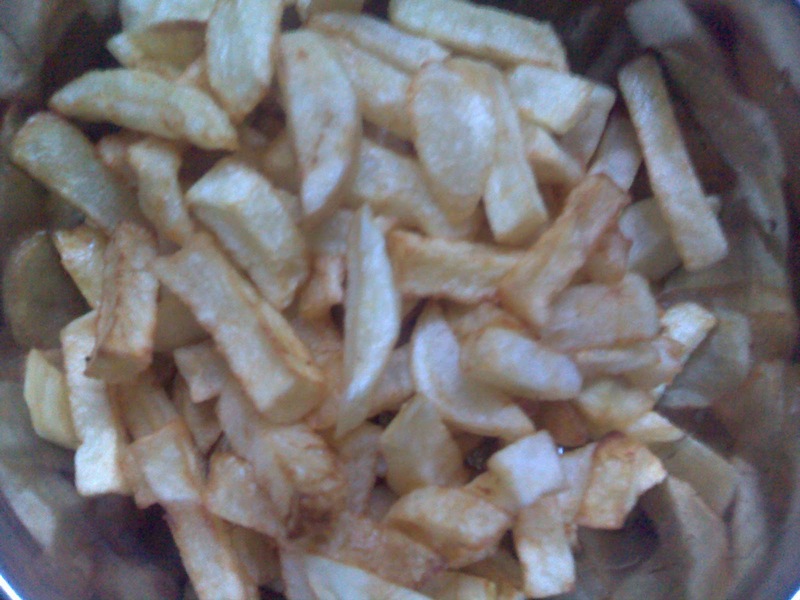 When they are sprinkled over hot chips, they tend to absorb the taste really well. Now the french fries or crisper finger chips are ready to eat. Preparation Time: 1 day (including the freezing time or else it just takes 30 mins). Serving Suggestion : Serve hot with tomato ketchup. For good results, cut the potatoes into thin strips. Freeze the strips in zip lock bags so that it remains safe from water. The more you freeze, the more crsiper chips you get. But never store them for more than 2 days. Sprinkle the red chilli powder and salt when its hot so that it absorbs them well. hai... i was searching for the kadai chicken images in google and found your snaps and then blog.. you have goood collection of indian food... so happy to see u..my name is Lena and im frm kerala and settled in banglore..